BSA’s mission is to prepare young people to make ethical and moral choices over their lifetimes by instilling in them the values of the Scout Oath and Scout Law. Our priority is to bring the benefits of Scouting to more youth while remaining true to our mission. We are excited to announce beginning in 2018, our Cub Scouts program will be open to boys and girls. By welcoming both girls and boys into the program, even more youth will have access to the character development and values-based leadership that Scouting promises and be better prepared for future success. Beginning during the scheduled launch of Feb. 1, 2019, girls can join all-girl troops. Boys can continue to join all-boy troops. 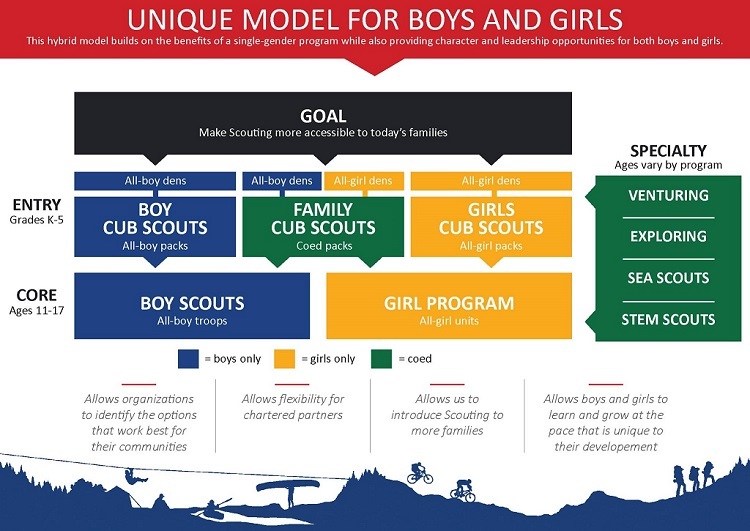 Scouts BSA will not have any mixed-gender, or coed, troops. Please fill out the form below to receive updates and find out when a Troop starts near you! Sign up to get information as we prepare for this new program.